The Gujarat Common Entrance Test conducted by Gujarat Secondary education board i.e. GSEB. The official website of of GSEB is www.gseb.org. The Gujcet is an entrance test for those candidates who want to take admission into government and private medical college of Gujarat state. There are many courses available in the GUJCET 2018 exam i.e. BDS, MBBS, Physiotherapy, Homeopathy, Ayurved, Nursing, Optometry etc. More than 1 lack candidates register every year for the GUJCET 2018 exam. For more detail please visit official website of gujcet 2018 test. GUJCET Application Form 2018 : As we know that before appearing the GUJCET 2018 exam all eligible candidates need to apply for the GUJCET test means first have to register and fill GUJCET application form through official website. If you want to fill GUJCET applications form than you have scanned documents like marksheet, caste certificate, signature, photo etc and fee. The GUJCET application form 2018 available from in the month of March 2018 at official websites. GUJCET Eligibility 2018 : Before filling the GUJCET 2018 Application form candidates must have to check their GUJCET eligibility criteria. Those candidates have 12th standard science certificate and those candidates who are appearing in the 12th science standard exam they are also eligible for the Gujarat CET 2018 exam. GUJCET Test Types 2018: In the GUJCET exam there are 120-160 questions asked from Physics, maths, bio, and chemistry subjects. For those test there will be 3 hours time given by GUJCET exam board. GUJCET Admit Card 2018 : As we know that the GUJCET exam held on in the month of MAy 2018. Before the exam GUJCET Admit Card available from first week of May 2018. 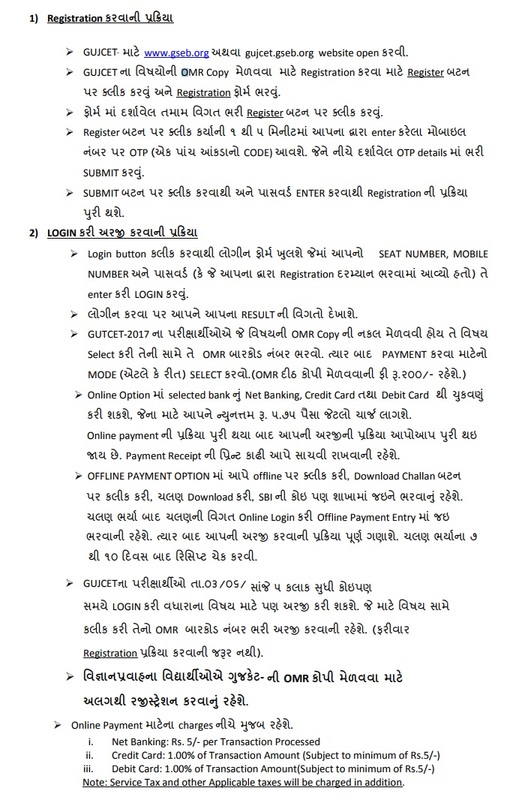 The GUJCET admit card download from official website through GUJCET application number and date of birth of candidates. GUJCET Answer Key 2018 : After the GUJCET exam all candidates want to check their answers and they have to match their answers with official GUJCET Answer key 2018 which is available at official websites of GUJCET exam. Many coaching institutes also give the GUJCET answer key 2018. GUJCET Results 2018: After cross check the GUJCET Answer Key 2018 all candidates are also want to download GUJCET Results 2018. The GUJCET Results contain obtain marks, GUJCET Merit rank of category as well as general category. The GUJCET Result download with the help of GUJCET roll number and date of birth of candidates. The GUJCET Results will be available on June 2018. GUJCET Counselling 2018 : After the disclosing the GUJCET results all qualified candidates participate into GUJCET counseling. With the help of GUJCET Counselling 2018 all qualified aspirants get their seats in the various reputed governments and privates colleges. The courses allotments are based on the merit rank of GUCET 2018 exam. All the information regarding GUJCET 2018 counseling available at official website.